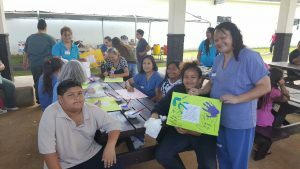 HONOLULU – Keiki O Ka ‘Āina Family Learning Centers hosted a Kid’s Day this afternoon at the Women’s Community Correctional Center (WCCC) to bring incarcerated moms and their children together to celebrate Mother’s Day. 17 inmates and 37 children participated in this year’s event. WCCC has partnered with Keiki O Ka ‘Āina Family Learning Centers (KOKA) to hold Kid’s Day since December, 2005. The time is used by mothers and children to interact in a positive setting, within a prison environment, through food, games, crafts and activities. 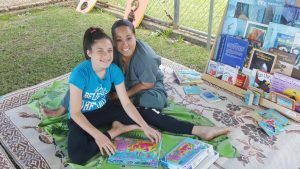 While incarcerated, mothers were able to spend some positive time with their keiki, playing, hugging, talking and eating within the 3-1/2 hours allowed. 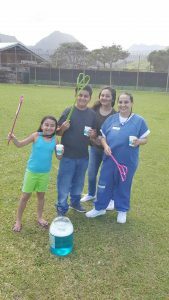 They also engaged in specially designed games, made a craft together, and played volleyball and football with their moms. An early education area was provided with books, blocks, and playdough. “The women and their children need this quality time together to strengthen bonds and mend relationships,” said WCCC Warden Eric Tanaka. “Having this important visit during the Mother’s Day weekend makes it even more special for them. We appreciate all of our community partners, like Keiki O Ka ‘Āina, who devote hundreds of hours organizing these family visits”. “Strengthening families is a cornerstone of Keiki O Ka ‘Aina and this event is one that is near and dear to our hearts. We applaud WCCC as a leader in making efforts to keep families connected, ” added KOKA Executive Director Akana. 31 community volunteers, including members of the Honolulu Pau Hana Rotary Club, spent their Saturday at the facility making sure the women and their children had a good time. A select group of WCCC inmates’ prepped, bar-b-que’d and served the lunch. Bake-A-Blessing Outreach Ministry from Inspire Church in Waikele provided enough cupcakes for the moms and kids, as well as the prison staff. The Laulima Giving Program donated toys for this special event, and keiki were allowed to choose 2-3 items to take home at the end of the day. Pictures from today’s event are attached. You can find the full photo album on our Facebook page at www.Facebook.com/HawaiiPSD. (We will be adding to it as more pictures come in so check back frequently).